Digitizing content from historical sources is the first fundamental part of Digital Humanities. The automatic data enrichment is as important since it guarantees standardized research. Hence, the digitization and data enrichment are closely linked and form the basis of today’s Digital Humanities. We develop a mobile scanning device that enables historians to digitize archival documents on the go. A ScanTent is developed within the framework of the READ project. 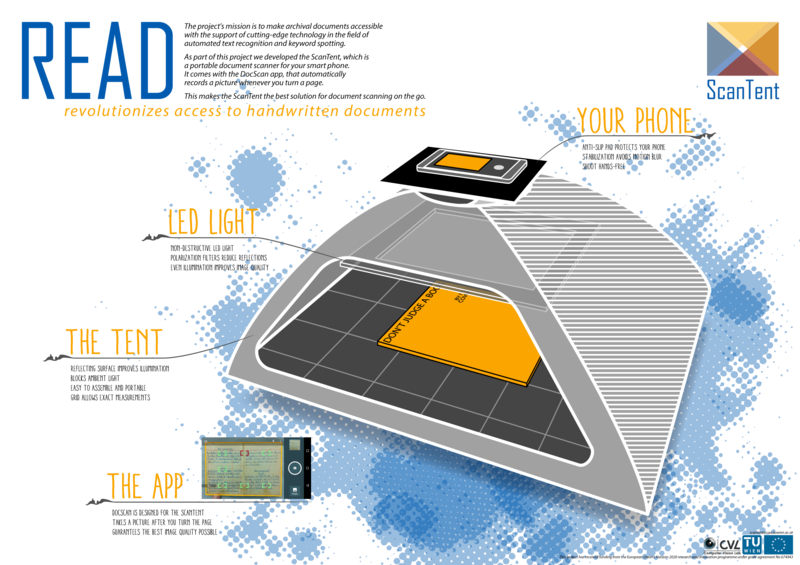 The tent is ideal for document scanning because it blocks ambient light an functions as mount for any smartphone. An Scanning- App is developed as part of this DI4DH project, that empowers the ScanTent. DocScan automatically detects documents in video live streams and checks if the camera settings are ideal for document scanning. It further detects page turns and shoots pages automatically thereafter.